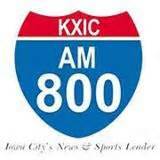 IowaWatch was featured during a large portion of the Tuesday, July 15, “Your Town” show on KXIC radio, AM 800, in Iowa City. Host Jay Capron interviewed Executive Director-Editor Lyle Muller during the first part of the program about the Sarah Hadley story, “Iowa’s Texting-While-Driving Ban Not Reducing Crashes, Hard To Enforce”. In a second segment, after news and a different feature, Capron and Muller talk about the Lu Shen story, “Iowa Chinese Students Struggle To Adjust, Feel Lack Of Support“. Advertising in this podcast is KXIC’s. IowaWatch receives no revenue from it. If you would like to support our nonprofit journalism with a tax-deductible donation please go to this link. Your donation helps us produce our nonprofit journalism, and is appreciated. You can hear the Iowa Center for Public Affairs Journalism’s original radio program, the IowaWatch Connection, on KXIC at 8:30 a.m. each Sunday.